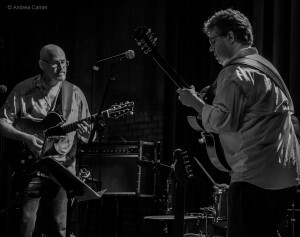 Long-time cohorts in Portland, Oregon, guitarists/bassists David Martin and Mike Doolin teamed up on the well-regarded Reflections (2009), and in 2014, repeated the collaboration on Tough Commute. (Once Martin relocated to the Twin Cities a few years ago, their collaboration required a “tough commute.”) The duo didn’t wait so long this time, as their new Dark Star will be celebrated at five different Twin Cities venues in five days, starting at the Icehouse on November 28, and wrapping up at Jazz Central on December 2. And if that’s not enough guitar, Mike and Dave will hold a guitar-building and repair workshop on December 3 at the St Paul Guitar Center. David Martin was born in Toledo, OH and grew up in Charleston, WV. He graduated from Capital University’s Conservatory of Music in Columbus, OH. A composer, arranger, teacher, and performer, he played in the Columbus area for several years before moving to Minneapolis, where he lived for 13 years. 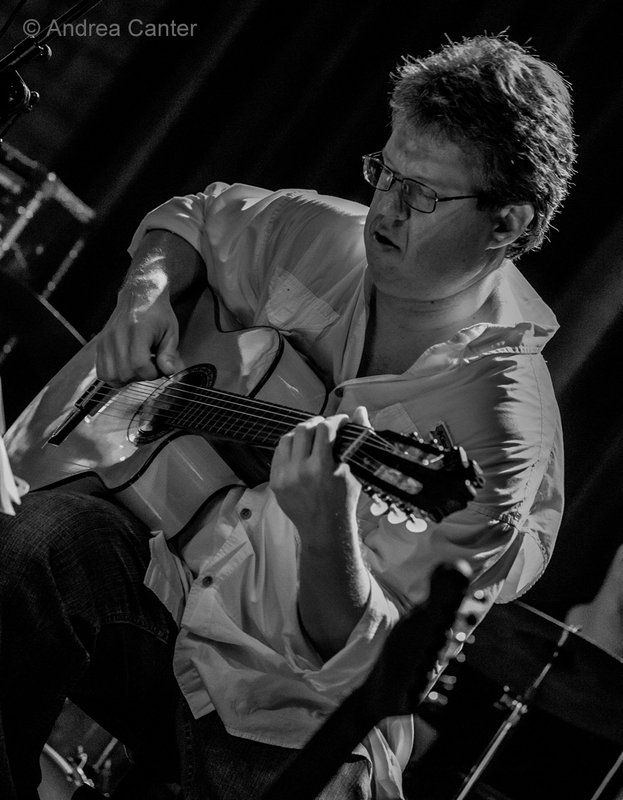 In the Twin Cities, Dave led his own jazz trio and also played in Nachito Herrera’s Puro Cubano, Beira Mar Brasil, Latin Sounds Orchestra, Salsa Del Soul, Robert Everest and Havana Hi-Fi. 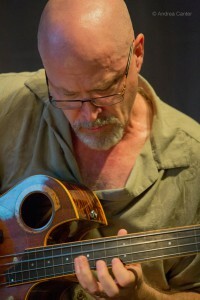 In 2009, Dave moved to Portland, OR where he teamed up with Mike Doolin, releasing Reflections. Back in the Twin Cities since 2010, Dave has accompanied many local vocalists including Maryann Sullivan and Paula Lammers, and performs regularly with Salsa del Soul, Beira Mar Brasil, the Bill Simenson Orchestra and Twin Cities Latin Jazz Orchestra. Rude, and Cruise Control. 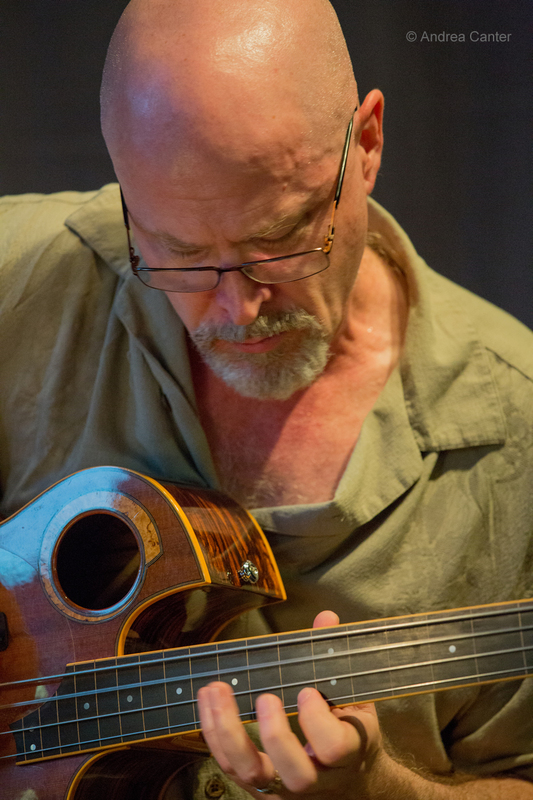 Mike is also an internationally respected guitar maker who founded Doolin Guitars in 1995, and worked for about 17 years as a solo luthier, crafting handmade acoustic guitars for recording artists Esperanza Spalding, Muriel Anderson, John Stowell, Justin King and Nancy Conescu. As a bassist as well as guitarist, Mike has explored ways to merge the two instruments via the harp guitar, which he began building in 2006. In 2013, Mike switched to the seven-string guitar which provides extended bass range for duo performance. He’s also discontinued his luthier business to concentrate again on performance. Doolin also serves as recording engineer at his studio, House of Doolescu, in Portland. The Doolin/Martin partnership has again yielded a disc of original music recorded in Portland in Doolin’s studio, House of Doolescu. 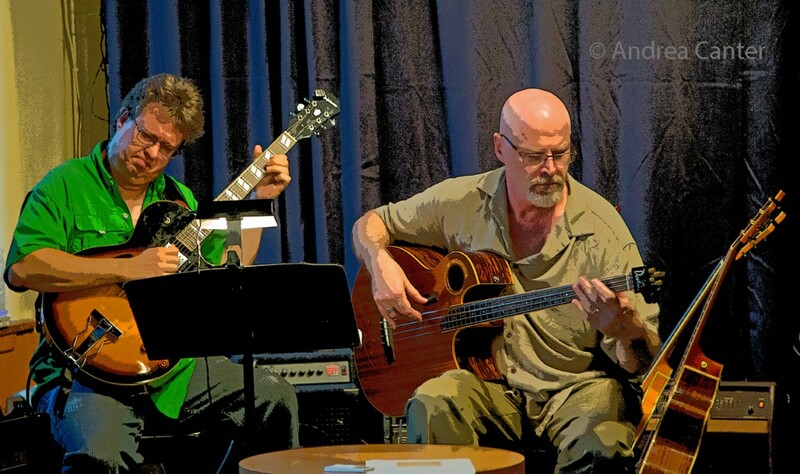 And as on the previous recordings, both Dave and Mike play acoustic and electric guitars, acoustic and electric bass, with support from Ward Griffiths on drums. Twin Cities percussionist and conguero Shai Hayo appears on two tracks; pianist George Mitchell and organist Louis Pain appear together on one track. A welcome part of the packaging is the listing of each track’s string instrumentation including the order of solos. There is some consistency in the structure of each track: “Generally, whoever wrote the song is doing the melody, and we’ll start recording as a trio with guitar, bass and drums, and then the second person adds the other guitar. We broke that rule a couple times. He wrote a song called ‘Brother Dave’ for me on the new CD where I do all the melody. I wrote a song called ‘Go Ahead Mike’ on the new CD, which is all him. I’m just strumming acoustic guitar through the whole thing. So we break the rule occasionally, but generally that’s how we do it.” And it works, and as noted above, the listener can quickly identify who is doing what, on what instrument. 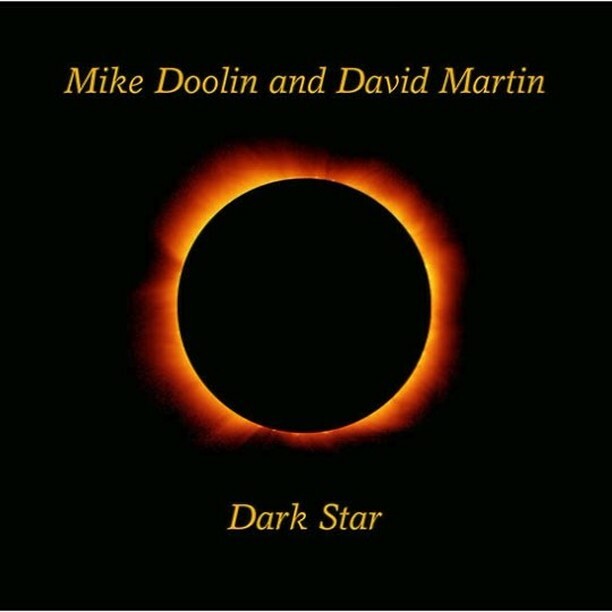 Dark Star covers 11 original tunes, six from Martin and five from Doolin, most performed with a combination of electric and acoustic instruments. All electric tracks include Martin’s opening “Give the Drummer Some” and “Writers’ Block, somewhat grungy rockish tunes that seems perfectly designed for the usual Icehouse vibe, with both guitarists soloing on electric and Martin also adding electric bass to the first track. On Doolin’s “Spring Came Early,” with Mike on electric guitar and Dave on electric bass, the feel is far more relaxed and tropical; Dave’s solo bounces with delight. Dave’s “Coeur D’Alene” is appears in two different arrangements, the first as a trio for electric guitar and acoustic bass guitar with Griffiths on drums, the second (and final track) an all-acoustic guitar duo, with Dave on nylon string, Mike on steel string. Both versions offer elegant, balladic interpretations as the strings weave in and out, the first melding guitar with bass and brushes a darker reading, the second a lighter, more Latin leaning track — both sparkling demonstrations of these artists’ gifts of exquisite restraint. The rest of the album further demonstrates the breadth of Martin and Doolin as composers and performers who bring out the best in each other. Doolin’s title track hints at Martin’s affinity for Brazilian music, while Doolin’s “Brother Dave” (with Pain on organ, Mitchell on piano) is a bit snarky and churchy at the same time. Extra string power dominates Martin’s “Go Ahead Mike,” as Dave brings out the 12-string acoustic guitar along with the six-string and both add electric bass, Hayo doubles on percussion here, with congas and shakere. More voltage translates Doolin’s “Dad in a Cad Car” into an adventure soundtrack as electric guitars team up with acoustic bass and steel string. Alternating electric guitars and acoustic bass guitars, Doolin’s “The Missle Room” skips along brightly like a 70s instrumental Top 40 hit, while Martin’s “System,” with his squealing electric,Doolin’s bubbling basslines, and Griffiths’ pounding antics, suggest the “innovations” introduced by Marty McFly to his unsuspecting Back to the Future classmates. In the 21st century, of course, we’re ready, and we love it. Mike and Dave present their guitar building and repair workshop at the St. Paul Guitar Studio on Saturday, December 3 and 4 pm (308 E. Prince Street, St Paul). Copies of Dark Star will be available at the CD release celebrations and online at CD Baby.